Too little attention has been paid to the most vulnerable casualties of mass incarceration in America. There is nothing that should garner more bipartisan support than protecting the rights of our children. As a practicing lawyer of nearly 30 years, and a conservative Republican who served 14 years in the West Virginia Legislature, few issues were of more importance than reforming how our criminal justice system treats children. Over the years too little attention has been paid to the most vulnerable casualties of mass incarceration in America — children. From the point of entry and arrest to sentencing and incarceration our treatment of children in the justice system is long overdue for re-examination and reform. As a founding board member of Human Rights for Kids, a nonprofit organization dedicated to protecting children from harm, reforming the justice system to promote rehabilitation of children charged with crimes, as well as many other aspects of child protection and well-being, we are seeking to create a complete paradigm shift in how the country treats children when they come into contact with the criminal justice system. 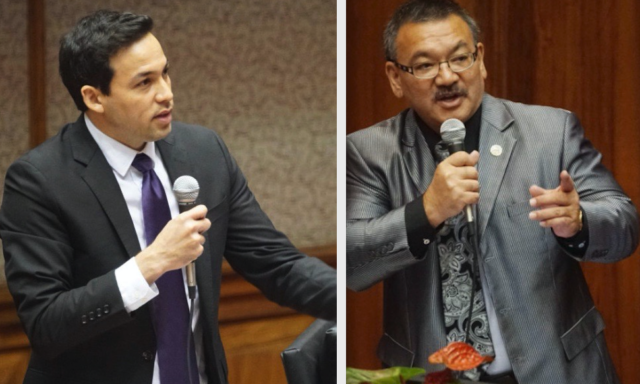 Reps. Chris Lee, left, and John Mizuno are advancing a bill to help keiki in custody. With the leadership of Hawaii state Rep. John Mizuno, who has introduced three important juvenile justice reform bills this session, Hawaii is poised to put greater safeguards in place to protect the human rights of children. One of those bills, House Bill 217, requires that when an officer has custody of a child under 16 years of age for potential criminal offenses, that the child be afforded the right to consult with legal counsel before waiving his or her constitutional rights and before being questioned about the alleged offense. HB 217 acknowledges the fact that children are still developing in many ways and are generally less mature than adults while being more prone to outside pressure. Thus, in the criminal justice context, children have a much more limited understanding of the legal system and hence a much more limited ability to understand or assert their rights under the constitutions of Hawaii or the United States. For example, the right to legal counsel is a fundamental constitutional right — yet I personally know that many children don’t fully understand the lawyer’s role (nor a judge or jury for that matter) in representing someone accused of a crime. How then can such a child knowingly and voluntarily waive the right to counsel? This bill does not diminish the seriousness of criminal investigation and prosecution. Statements can still be taken from children and valuable rights can be waived — provided the proper safeguards are met. In fact, I would argue that the safeguards in the bill also serve law enforcement by helping to prevent unsubstantiated claims of coerced or involuntary confessions for instance. Due process rights of the accused stands as the cornerstone of the American justice system. While adults have the capacity to understand their rights and avoid unintended self-incrimination, kids often lack the ability to fully comprehend their due process rights before waiving them. HB 217 ensures that kids are able to speak with legal counsel before waiving any rights for custodial interrogation. Such protection helps to safeguard due process rights for minors who would otherwise be unable to assert them alone, and in doing so, moves another step closer to ensuring justice for all. I couldn’t agree more with Chair Lee, and it is for those reasons that HB 217 is so important to protecting children’s rights. The fact that the Hawaii legislature is willing to take on such difficult but necessary work is a credit to the state and the leadership of Reps. Mizuno and Lee. I would add that this is even more true when those children are accused of a crime. John Ellem served 14 years as a member of the West Virginia House of Delegates where he was minority chair of the House Judiciary Committee for eight years. He has been practicing law for nearly 30 years and is a member of both the West Virginia and Ohio State Bar. Ellem is a founding board member of Human Rights for Kids, dedicated to advancing children's rights in the United States and around the world.